Every hunter should be thoroughly trained in hunting safety. But hunting from a treestand has its own set of safety procedures that go with it and if you are hunting from a stand, you’re definitely going to want to know them and have them down cold. HunterCourse.com has a wonderful, free, online treestand safety course. If you ever hunt from a treestand, take the time and do this course. They could not have made it any more convenient and easy. It’s free. It’s online. And you can do it at your convenience. Sometimes sighting in your rifle can be confusing. I personally don’t tend to turn the dials the wrong way, but I’ve seen others do it more times than I can count. I’ve also seen them turn the wrong dial. Well who knew that this was even possible… but now you can practice sighting in your rifle online! HunterCourse.com has a great interactive rifle range. 1. You can choose from 3 different ranges: shotgun range, rifle range and archery range. 2. You can choose from 4 different target types. 3. There are 3 sight options; open, peep and telescope. 4. You can change your shooting position to either standing, sitting, kneeling, prone or bench rest. This fun interactive range takes your through all of the steps to get your rifle sighted perfectly. It’s fun and educational! 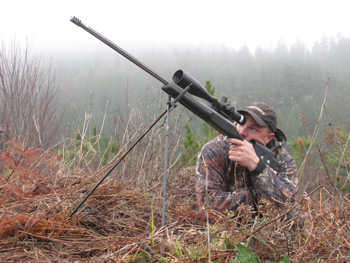 One of the most important and essential components of hunting is safety. It is a basic element. It is a building block in which all other hunting activities are based on and built upon. Whether we are hunting alone on our own private property or on public land with countless other hunters around us, we should always be looking through our proverbial safety glasses. It is always heart wrenching to hear stories about hunting accidents. Of course, no matter how much you know and prepare, an accident can happen. But many accident are avoidable. No matter how much you know, you don’t know everything. You can always learn something new. Even an old dog. “Butchering an elk,” Bryson said, a little more than annoyed by the nosy old man. The old man raised an eyebrow. “Well that might be what you think you’re doing anyway!” And with that, he proceeded to walk over to Bryson and show him a thing or two about butchering. It ends up that the old man was a butcher for over 60 years. He knew a lot. Bryson has also been doing his job for some time and his father was a butcher too. Bryson was smart. He didn’t have to know everything. He recognized immediately that this old man had a lot to teach and that he had a lot to learn. He shut his mouth and learned a lot that day. So again… no matter how much we know, we can always learn more. And hunter safety is so important that we should always assume there is more to learn. Lives depend on it. Let me introduce you to Hunter-ed.com. They offer free online safety courses for your state (33 states at this time). You simply choose your state and register for free. They have made the official state curriculum fun and easy. You can learn at your own pace with engaging and interactive animations and videos. Learning hunting safety has never been so easy! This is MY next step on my hunting to-do list. I hope to see you there!